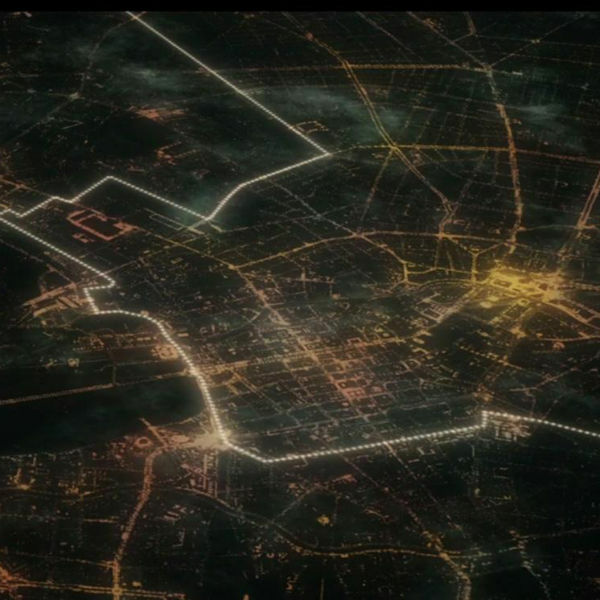 Aerial view of the 8,000 lit balloons tracing the path of the Berlin Wall. Photo from Wired. Today marks the 25th anniversary of the fall of the Berlin Wall and there’s a maelstrom of media coverage about the event. (Sadly, the word maelstrom has Dutch origins, not German ones.) Given that this time last year we were living in Berlin, I’ve been following the celebrations and reading as much as I can about the event itself. Amazing photos of the Lichtgrenze (border of light) art installation commemorating the fall of the Wall. A great overview of the Wall itself and what happening on 9 November, 1989. Black and white photographs of the Wall from the 1960s to 1989. Info on Berlin sites that harken back to a divided city like as the Berlin Wall Memorial, which blew my mind when we visited last year. Great resource for visitors to Berlin. A historian’s take on what led to the opening of the wall on 9 November, 1989 – including a lack of trust amongst Stasi officers, incompetence from East German officials, and the solidarity of the freedom movement. About the East German border guard who opened the first gate on 9 November, 1989. An archive of articles from The Local (a German-focused English-language news source) about the Berlin Wall. Covers a range of topics, including a piece on Cold War kitch, and a gallery of photos from then and now. About this time last year we took a jaunt to Denmark and were aboard a train that was on a ferry (and then got stuck in Northern Germany in a wind storm). We thought that was crazy (trains on a boat! 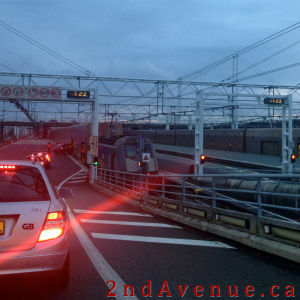 ), so when the chance to take the Eurotunnel Shuttle (cars on a train!) arose, we jumped at it. Not only is the Eurotunnel crossing a lot shorter than taking ferry across the English Channel (about 40 minutes vs at least two hours), their website also promised hassle-free pet travel – and they delivered. Getting Sofie cleared to travel to the UK was easier than I had feared it might be; pet reception was easy to find, the line moved quickly (and we met a gaggle of golden labs while waiting), Sofie’s microchip was scanned and her pet passport was scrutinized… and we were presented with a windshield sticker and bid continue on our way. The next step was self-check in, where we secured a spot 40 minutes earlier than our reservation, and then on to French and UK border control. The French agent barely even looked at our passports (prompting a little panic that we hadn’t gotten exit stamps and might need them). The British agent made small talk about Dover (where we were headed and he lived) before stamping our passports in the requisite spots and sending us on. After a short wait and a little cursing at British tourists being idiots (I generally consider the British good at queuing, but the bathroom line-ups were utter chaos! ), we proceeded to the loading area. We had little idea what to expect and were maybe a little too excited when we were directed along a causeway towards a railyard. Though we logically knew that vehicles went onto rail cars, the reality of it was a little surreal. Cars on a train! The excitement built as we actually saw cars driving onto the train – and then reached fever pitch as we realized that we would be driving onto the upper level of the rail car. 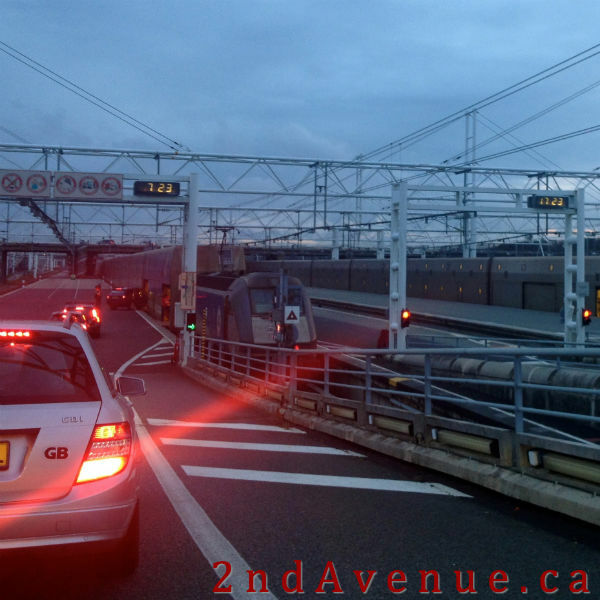 Cars on a train… stacked on top of each other! The railyard outside the windows was quickly replaced with blackness. We could feel the angle of the car change and knew we were dipping down to the 75m depth of the Chunnel. Cars on a train… stacked on top of each other… underneath a huge body of water! The ‘you are approaching your destination’ announcements started well in advance of our actual arrival and their overeagerness, coupled with the distraction of fiddling with the sat nav, dimmed our excitement of arriving in the UK. But the adventure of travelling by car loaded onto a train was everything we had hoped – and maybe even a little more. 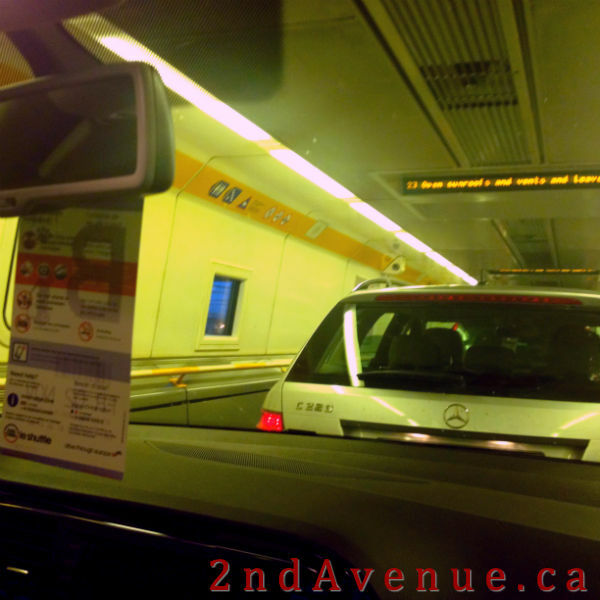 We took the ferry from Newhaven to Dieppe on our way back to the continent and vastly preferred the car/train option. While the ferry was less expensive than the Eurotunnel Shuttle and had amazing views of the southern English coast, it took four hours and we had to leave Sofie by herself on the car deck. Much more fun to be all together in a car on a train that goes underneath the English Channel! In addition to becoming better at clearing out a kitchen (as I posted about yesterday), moving frequently has also made me better at living minimalistically. 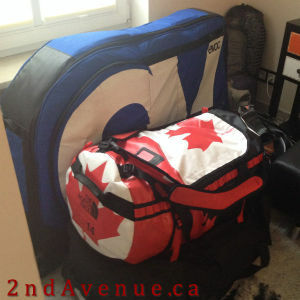 All of our stuff (clothes, shoes, toiletries, electronics, reading materials, random housewares, my husband’s beloved road bike) fits into one bike case, two large duffle bags, and a couple smaller bags. This is almost everything we own. It all fits into a tiny alcove in our Munich flat and should easily cram into our rental car for the trip to Mannheim, our homebase for the next two months. When I think of how much stuff used to fill our two-bedroom condo in Canada, I’m shocked (and impressed!) that we’ve condensed so much. We left a few pieces of meaningful furniture and some items we’ll need to stock an unfurnished apartment in a small storage locker, but otherwise we travel with pretty much everything! We were at the absolute weight limit of our baggage allowance on the flight from Calgary to Frankfurt (and paid an extra bag) and have been paring down since. We moved from Frankfurt to Berlin via train and then between flats in Berlin by taxi; the physical difficulty of moving all our stuff spurred us to keep only essentials. There are no moving companies, no wheeled dollies, and no family & friends to lift cardboard boxes – just the two of us. 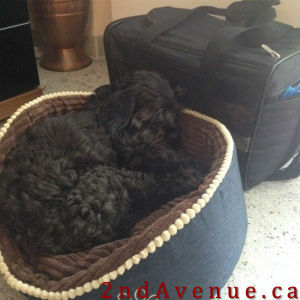 And a dog who really can’t carry anything – although she has a fair amount of her own stuff! One of the upsides of minimalism is that packing is pretty quick. All our bags were filled in under an hour and there’s limited risk of accidentally leaving something behind! We hit the road in a few minutes and are hoping for a smooth trip between Munich and Mannheim – and then more adventures as we explore Baden Würtemburg! We’re leaving our flat in Munich tomorrow for one more new-to-us German city. We’ve done a lot of relocating in the last year and I’ve definitely gotten better at not leaving good stuff in the pantry. 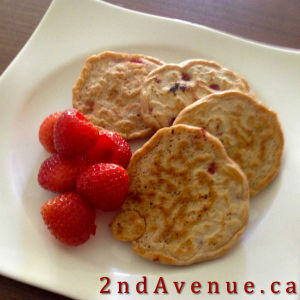 In order to clean out our cupboards over the last week (and because baking is one of my stress-relievers), I made ham & cheese loaf, applesauce muffins, two batches of brownies (one that failed miserably), and super-easy pancakes (recipe below). These come together super-quickly (as you’d expect with pancakes) and don’t require any measuring equipment other than a teaspoon and a mug – very useful for ill-equipped kitchens, lazy cooks, and short-on-time mornings! 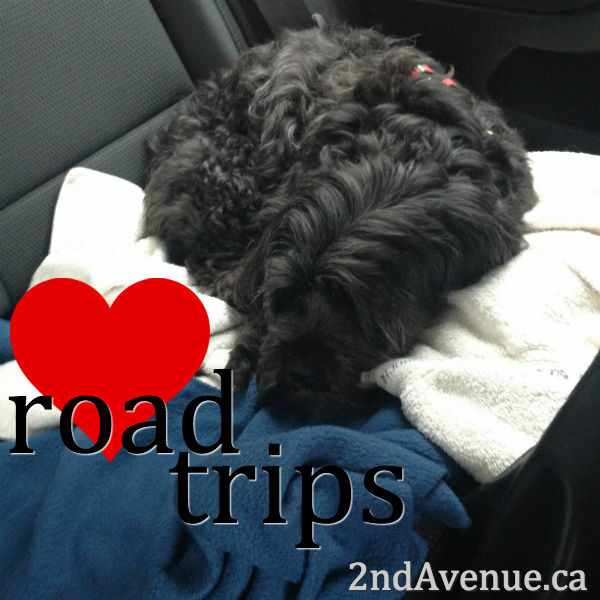 The past month has been all about road-tripping. We’ve been through seven countries and driven more than 5,000km since the middle of September (my husband’s time in the car has been even longer and he’s hit an additional country!). While travelling has been fantastic (and Sofie loves being in a car! ), hours in the passenger seat have taken a toll on me; my low back is sore, my hips are tight, and my shoulders are hunching. I had a couple car-free days earlier this week and I knew yoga would help me feel better, but was feeling really lazy and unmotivated. Thank goodness for the wonder of YouTube! A quick search for ‘yoga for low back pain’ turned up a short sequence from Yoga With Adriene that looked promising. 15 minutes on the mat relieved a lot of the tension in my low back and prompted me to do another sequence with Adriene. Turns out she has a whole series of free online yoga practices! I like Adriene’s relaxed, friendly, unscripted style. Her slight rambling and occasional diversions remind me of a good friend and overall Adriene seems approachable and very real. It’s also great to follow someone else’s sequence rather than thinking about what’s coming next! Most Novembers I’m annoyed with retailers who slap up Christmas decorations and promote holiday merchandise the second Halloween is over. Turns out Canadian stores are more patient than German ones. 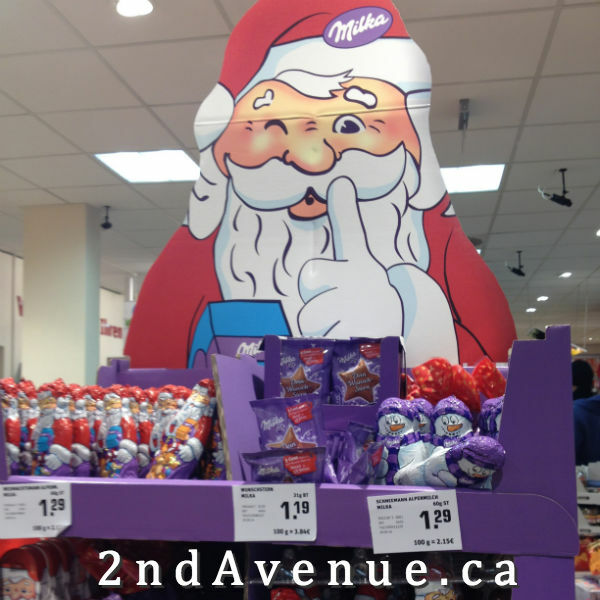 The Christmas treats and product displays started appearing in Munich’s stores in September – before Oktoberfest even started! Festbier (the strong brews created to celebrate Oktoberfest) and Lebkuchen (gingerbread-like Christmas cookies) have been side-by-side on the shelves of our local supermarket for weeks and no one seems to think it strange. I came back from the yoga retreat in the Czech Republic feeling relaxed and happy. Maybe a little too relaxed as my drive to write entirely disappeared. The perfect balance of scheduled activities and free time at the retreat left me a lot of thinking space, which included pondering my ambition to write a book. I’ve been mulling over writing about breath and breathing from a variety of perspectives,1 but haven’t buckled down and gotten much of anything done. No solid outline, nothing drafted, just a bit of research, some scattered ideas, and a few bookmarked websites. My initial goal was to have an outline complete by the end of 2013, but almost 10 months have passed and I have found all sorts of other activities to occupy my time. With the space to think about my nebulous dream to write a non-fiction book as enjoyable and informative as Mary Roach’s Stiff, I realized that I don’t have the necessary ambition – at least, not right now. I’m unwilling to muster the motivation and discipline to make it happen, which is making me feel guilty and delinquent. Those feelings, in turn, make me less willing to commit to writing and less likely to produce anything meaningful. So, I’m tossing the idea of writing a book overboard. 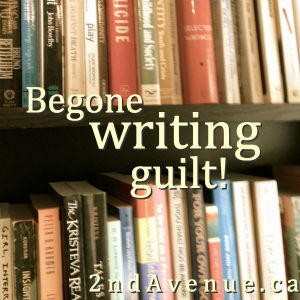 I’m abandoning my thesis on breath and breathing… and letting go of guilt. Perhaps I’ll circle back to the idea of writing a book later on, but for now I’ll content myself with posting travelogues and recipes!